I excluded boerewors because it’s a category in itself. Here is where to find the best locally made bangers. Remember with artisan sausages in particular, a higher price usually means less other nonsense goes into them. Cure Deli. If processed bangers are all you know, Martin Raubenheimer’s artisanal pork sausages will rock your world. Only hormone-free, hand-sourced quality meat with no cost-cutting fillers, bread or preservatives. Made in his parents Bergvliet garage, the range varies from chorizo to Toulouse or sundried tomato. For the incredible, chunky bacon and apple or pear sausages, he cures the bacon first. Price point in April 2015: various pork sausages cost R127 per kg, or a pack of four or five for R45 to R55. Cure Deli Oranjezicht City Farm and Tokai Earth Fair Markets. 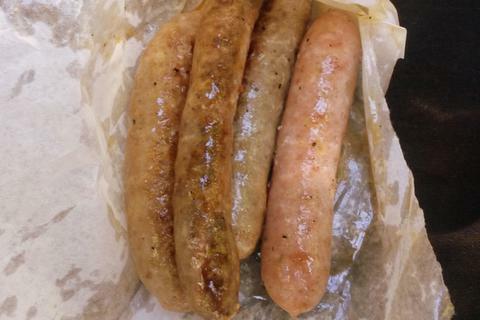 Ollie’s Fine Meats and Sausages. 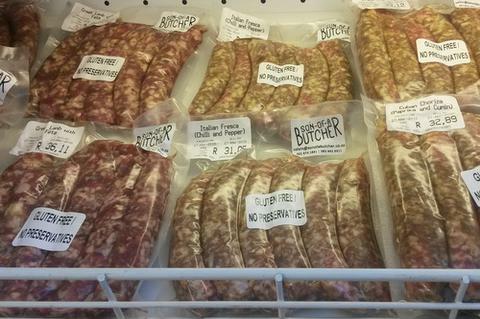 Formerly trading as Rudi’s Sausages, Willie Viljoen uses personal recipes and spice mixes for his 17 sausage classics. ‘We mince and stuff by hand,’ he says. ‘They’re gluten-free, with no rusks, wheat or bulking agents.’ His range includes Argentine or unsmoked Spanish chorizo. There’s a Toulouse, five Italian sausages, two German and two English sausages. Wild goose, venison and sour fig sausages are seasonal. 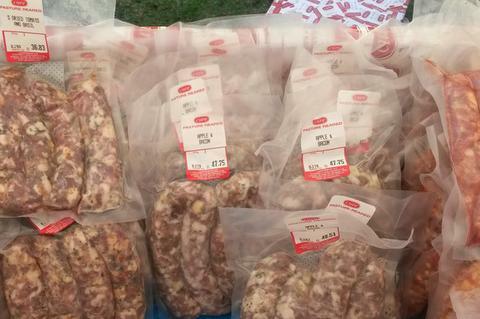 Price point in April 2015: sausage prices vary but average at R90 per kg. Gordon’s Bay shop, Root 44 Market and Slow Market Willowbridge, Tel 072-556-1701. Son-of-a-butcher. Salvin Hirschfield’s dad really was a butcher, and his quality Glen Oakes farm pork, grassfed beef or free-range lamb sausages have only natural ingredients with his spice mixes (no fillers or preservatives). The pork sausages are endorsed by Grass Consumer Food Action – I love the fine-textured bacon, and uber-popular chilli-flecked Italian salsiccia or sweet Spanish-paprika Cuban chorizo pork sausages. Some enjoy the robust, harissa-ish lamb merguez, or Wagyu beef sausages. Price point in April 2015: various sausages cost R85 to R120 per kg. Oranjezicht Farm Market and Neighbourgoods Market. Tel 082-307-9985. A version of this appeared in The Times on 1 April 2015.